Make walls speak for themselves...Create visual impact with vinyl artwork for surfaces. Vinyl artwork can be applied to walls, doors, cabinets, floors, columns, & windows. If you have a prospective application, please contact us. We are experienced in concepting & directing design, production and installation -- and we work with a variety of artists to meet your creative needs. L'Attitude Gallery owner and art consultant, Betty Bothereau, recently provided art direction and coordination for several vinyl wall-art installations at Children's Hospital Boston. L'Attitude Gallery owner and art consultant, Betty Bothereau, recently provided art direction and coordination for several vinyl wall-art installations at Ch ildren's Hospital Boston. 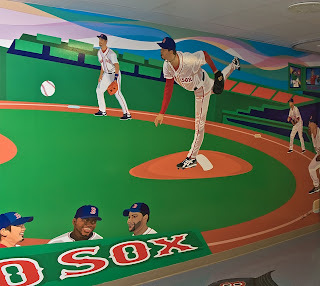 The Josh Beckett Treatment Room features brightly rendered images of the Red Sox playing in Fenway Park, with Josh Beckett at the mound. The artwork covers the walls and cabinets, as well as parts of the floor and doors, providing entertainment and a useful distraction for children undergoing cancer treatment. Columns (below) are wrapped with abstract imagery, brightening a nurses' station. Please contact us if you are interested in exploring the use of vinyl surface artwork. These elements are cost effective and easy to install. Possible settings include commercial, educational, restaurant, corporate, healthcare and residental environments.